You can use a light box to easily configure your own individual hard foam insert, or ask one of the HAHN+KOLB experts to do it for you. Tailor your tool storage divisions and arrangements to your own needs and wishes - simply, quickly, easily and without leaving the factory! 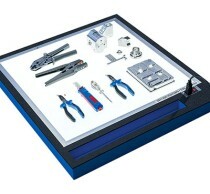 You'll need a light panel and our OPT-I-STORE-software (supplied free of charge) to design hard foam inserts. 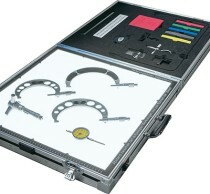 We offer the service both for existing tools and for new tools ordered from HAHN+KOLB. Our hard foam inserts are made of PE foam, which is lightweight and durable. It scores highly across the board thanks to its oil-resistant and water-repellent properties. Even sensitive parts can be stored safely thanks to its shock-absorbing qualities. Foodstuffs can also be stored safely, since hard foam inserts are odourless and food-safe. If you order the ESD design, you can also store electronic parts in the hard foam inserts. The largest hard foam insert is 1,500 millimetres long and 1,000 millimetres wide. Almost all sizes and cuts smaller than this are possible. Hard foam inserts are available in the following thicknesses: 30, 60 or 90 millimetres. Larger thicknesses up to max. 210 mm are available for custom models. The black surface layer can be combined with the standard colour blue as well as the colours red, green, yellow, white or grey. This will be the colour that is visible in the cut-outs. See at a glance which tool is missing. Organise your tools according to your needs. The custom-fit cut-outs protect against environmental influences and prevent tools bumping or contaminating each other. Even non-standard tools can be accommodated. The tools are stowed away securely. 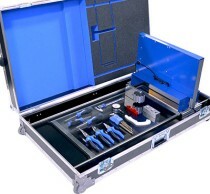 Hard foam inserts are therefore suitable for tool trolleys or transport cases, as well as for storage in tool cabinets. 1. Order the HAHN+KOLB light panel, the light box or the contour scanner. 2. Request log-in details and a link to the software (free of charge) using our form. 3. Place the tools on the panel and photograph or scan your arrangement. 4. Upload the images using the OPT-I-STORE-software and design your customised hard foam insert. 5. Once the hard foam insert you've designed has been stored, a price will be shown. 6. You can now confirm production and order the hard foam insert.